I would rather see the Pathfinding behavior examples! Please take me there now. Pathfinding behavior allows us to move objects to a selected destination as well as to flag items as obstacles. Objects that are flagged as obstacles will be avoided by the moving objects. To add behavior to an object, as usual, create the object. Then open the object's properties by right clicking on the Objects list located on the right of the Scene Interface. Select “Edit object” from the popup list. Now, select the behavior tab and click the “add behavior” button. “Pathfinding behavior” allows us to move the object to a destination while avoiding all objects flagged as an obstacle. After we add the behaviour to the object, we can customize a number of options. acceleration: this is how fast our object is going to accelerate while moving on a path. allow diagonals: test whether or not the object can move in diagonals. extra border size: sets the border size around the object. This setting determines how close the object can move to the obstacles. max speed: maximum speed the object can move on the path. rotate object: if you don't want the object to rotate while moving on the path, disable the object's rotation. 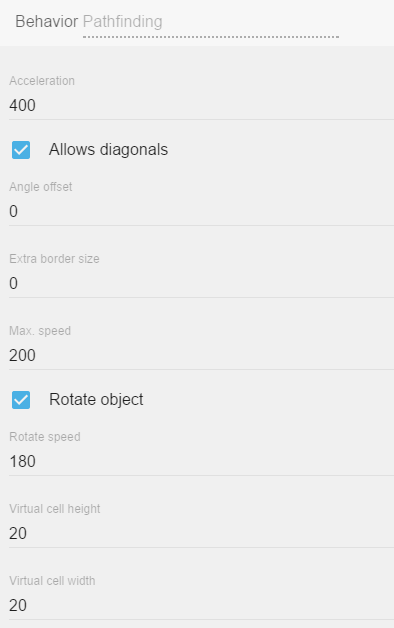 rotate speed: sets the speed of the object's rotation. virtual cell height and width: our path is generated using a virtual grid. We can change the size of the cells here, the smaller the cell size, the smoother the movement is going to be. A smaller cell size implies more calculations so try to still keep a size as large as possible. 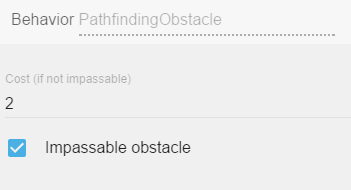 impassable: if we enable this, the obstacle is going to be impassable. The moving object is going to avoid it at all cost. cost: if the obstacle is not impassable, we can set a cost for the obstacle. The moving object, when looking for the best possible path to a destination, is going to prefer to avoid the obstacle with high cost values. For example, a river might have some cost. The moving object, if possible, will avoid it. However, if there is no other way around the river, or if the river has a lower cost compared to another area, the moving object will go through it (instead of climbing a mountain with a higher cost for example). And if we put crocodiles into the river and increase its cost, the moving object might decide to climb the mountains instead.